Enter one or two keywords to search these Wisdom Quotes. May you find great value in these Change quotes and sayings. 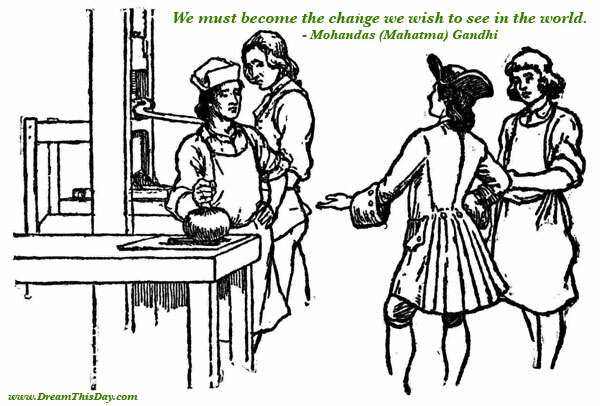 We must become the change we wish to see in the world. Change always comes bearing gifts. to be perfect is to change often. The dream you are living is your creation. It is your perception of reality that you can change at any time. by changing how you see. The inherent nature of life is constant change. To fear change is to fear life itself. The world is perfect. It's a mess. It has always been a mess. We are not going to change it. Our job is to straighten out our own lives. Change is the essential process of all existence. Change your thoughts, change your life. we become automatons. We cease to grow. dismiss that which insults your soul. the mores faster than people can accept it. need to be done according to priority. The simplest questions are the most profound. and watch your answers change. Habit and routine have an unbelievable power to waste and destroy. for that is what changes what you are. and not rather a new wearer of clothes. Open your arms to change, but don't let go of your values. as a criticism of themselves. When the music changes, so does the dance. We see what we ASSUME we will see. If you believe the world is evil, you will see evil. If you believe the world is good, you will see good. change your expectations of life. they are naturally enemies to innovations. "We've always done it this way." We must be the change we wish to see. and those who cannot change their minds cannot change anything. think of the beauty of autumn. the question is, which ones? For time and the world do not stand still. Change is the law of life. are certain to miss the future. You change the past when you change the way you see it. then what you are undergoes a transformation. There is nothing permanent except change. He who rejects change is the architect of decay. but rather to change the nature of the one who prays. you can start changing it. who would be constant in happiness or wisdom. When one door closes, another opens. that we fail to see the one that is opened for us. not merely to grasp the world, but to change it. you may end up where you are heading. Things do not change; we change. about yourself or your life that you want to change. for us to experience peace of mind. Intelligence is the ability to adapt to change. Life is change. Without change, there is no life. Why then do we so fight against change? there is nothing you will try to hold on to. there is nothing you cannot achieve. Goes the song, "we change, we change." But the music is still mine. is neither swift nor easy. you try and find that you can. Old deeds for old people, and new deeds for new. which is a lifelong project. Only the wisest and stupidest of men never change. The only human institution which rejects progress is the cemetery. you aren't enjoying the dream. change who you think you are. Never believe that a few caring people can't change the world. For, indeed, that's all who ever have. Change is inevitable - except from a vending machine. It's the most unhappy people who most fear change. is to help create it. and you can change that right here and now. You can choose to be peaceful right here and now. what other people do or think. that's got to be good, hasn't it? through his associations and sympathies. in the heart that says: turn back. up that we begin to see the present only when it is already disappearing. Change your thoughts and you change your world. Thank you for visiting: Wise Quotes about Change.